The Fender Japan Yngwie Malmsteen Stratocaster features steel inserts in the neck as a stock feature on the high-end model. 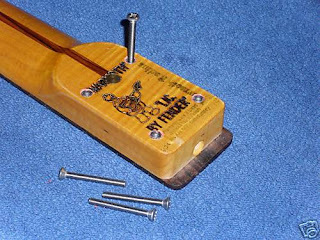 And virtuoso country guitarist Jerry Donahue has used these to faciltiate repeated dismantling of his Telecaster as he packs the neck and body in between clothing in his luggage, which he reckons is a safer way to check-in his guitar. Finally, these steel inserts are available as an after-market item. And with airlines really clamping down with even more limitations on carrying-on your prized instrument , installing a set of these steel inserts would give the travelling guitarist the option to 'do like Donahue does'. 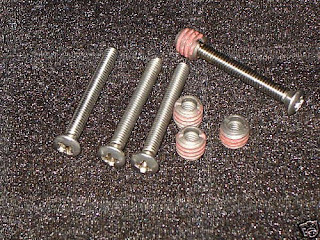 The seller claims the supplied stainless screws will not strip like conventional wood screws allowing the neck to be torqued for maximum neck to body contact and sustain. The outer threads of the steel inserts also feature an epoxy thread-locking compound which sets immediately upon installation, ensuring that the inserts are permanently secured. Just bear in mind that modifying that original '58 Stratocaster with steel inserts in the neck will seriously depreciate its value! On a remotely related topic, Stratoblogster has a wickedly funny post about disembodied guitar necks that could probably benefit from these steel inserts here. Nice find! I had to have those things put in my '72 Tele 3 bolt after the 2nd refret. Rock stable now!!! Great! I can see how a 3-bolt Fender would benefit from this mod.